RFK Stadium (officially named Robert F. Kennedy Memorial Stadium) is a 56,000-seat stadium that serves as the current home of the DC United Soccer Team as well as an arena for college and high school athletics, musical concerts and other major events. RFK Stadium is managed by the Washington Convention and Sports Authority, which also owns and manages the Washington Convention Center, the DC Armory and Nationals Park. The stadium has a natural grass playing field, modern lounge areas, 27 private boxes/suites, electronic scoreboards and a variety of concessions. Plans are underway to build a new stadium for DC United in SW Washington DC. The future use of RFK Stadium has not yet been determined (see details about the proposals below). RFK Stadium Festival Grounds hosts many popular events and festivals throughout the year including the Rock ‘n’ Roll DC Marathon, ShamrockFest and the DC Capital Fair. On-site paid parking is available for all events. The grounds are also home to the DC Open Air Farmers Market on Tuesdays, Thursdays and Saturdays, from 7 am to 4 pm, May through December. The closest Metro station is Stadium-Armory. Access to and from RFK Stadium from I-395 via the Southeast/Southwest Freeway has been rerouted due to the District Department of Transportation’s 11th Street Bridge Project. The DC United Box Office is located at the Main Gate behind section 317. It is only open on game days from noon to 9 pm for a regular 7 pm game. Gate B: near Parking Lot 8, designated for groups bringing in banners, musical instruments, etc. Event parking is $15. RFK Stadium has 10,000 spaces available in its parking lots. The lots fill up during major events and public transportation is suggested. Full season ticket holder parking is available in parking lots 3, 4, 5 and 8. Half season ticket holder parking is available in parking lots 3 and 8. The parking lots open four hours before most events. The Skate Park, designed by Pro Skater Geoff Rowley and California Skateparks, opened at RFK Stadium in 2011 and provides an outdoor venue for skateboarders. Located in Parking Lot 3, the 15,000 square foot facility is open daily from dawn to dusk. Parking is free for persons visiting the skate park. 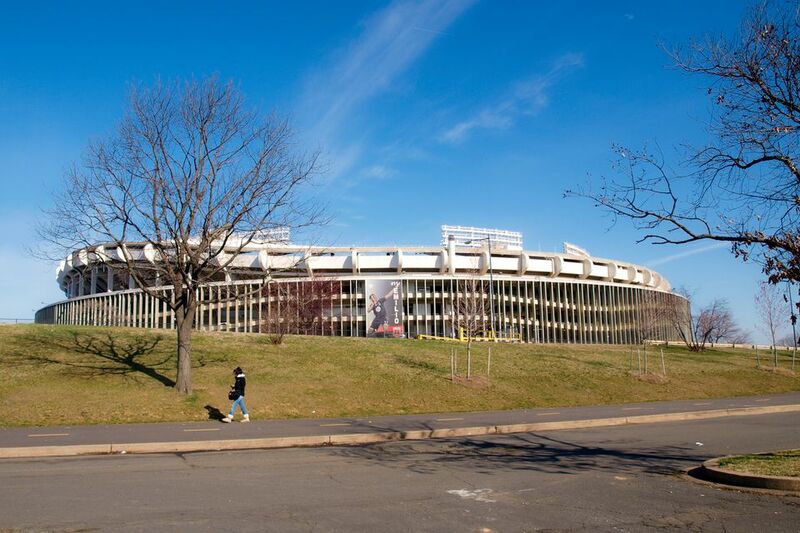 Renovations are long overdue and plans are being discussed to redesign and repurpose the 190-acre RFK Stadium-Armory Campus, the site including and surrounding the Stadium, Festival Grounds and the DC Armory. In April 2016, two plans were proposed to provide amenities that would serve the community and connect the current site with sustainable green space and flexible recreational space. Events DC, in collaboration with OMA New York and Brailsford and Dunlavey, participated in a series of stakeholder and community engagement sessions to get input on a new vision for the site. These design concepts offer two alternative approaches to addressing parking, infrastructure and road network, pedestrian connections, site conditions and program placement. Both proposals include three anchor tenant scenarios: 20k Seat Arena, NFL Stadium and No Anchor. All three scenarios reflect a phased approach intended to provide short-term programming elements that will immediately activate the site with uses that will serve the community. RFK Stadium was built in 1961 to house the National Football League's Washington Redskins and Major League Baseball's Washington Senators. Originally named the DC Stadium, RFK was renamed Robert F. Kennedy Memorial Stadium in 1969 in honor of the late Senator. The Senators moved to the Dallas/Fort Worth area in 1971. In 1996, RFK Stadium became the home to DC United, the Major League Soccer team. The Washington Redskins relocated to FedEx Field in Prince George’s County, Maryland in 1997. After a 34 year hiatus, in 2005, baseball returned to DC with the Washington Nationals, a team that had previously played in Montreal. RFK Stadium was modified to accommodate the Washington Nationals where they played until the new Nationals Stadium opened in the spring of 2008.